Egypt and Italy consider strengthening ties in the infrastructure and transport sectors by encouraging Italian firms to pump new investments into the North African state. This came on the sidelines of a meeting between the Egyptian investment and international cooperation minister Sahar Nasr and the Italian minister of infrastructure and transport Danilo Toninelli during Nasr’s visit to Rome. 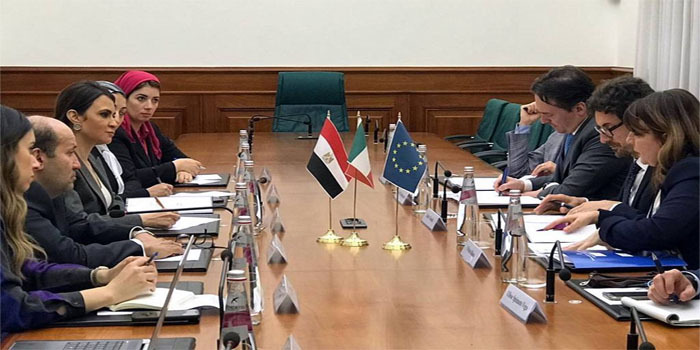 Both parties have discussed Italy’s support to a number of projects in Egypt’s transport sector such as railways and undergrounds, according to a statement by the Egyptian investment ministry on Tuesday. Nasr said that Egypt is keen on reinforcing economic ties with Italy in light of the strategic relationship between the two countries. Egypt’s transport sector is developing remarkably as its infrastructure attract investors, she indicated. The investment ministry is working along with the transport ministry in a bid to encourage the private sector to invest in such sector, Nasr added. For his part, Toninelli stressed that Italy aims to strengthen relations with Egypt over the coming period in the sectors of infrastructure and transport.